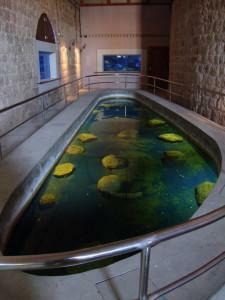 In November 2000, the U.K.-based Whale and Dolphin Conservation Society contacted MEDASSET about complaints received from a number of British tourists who had visited Croatia and were concerned about the poor living conditions of a captive loggerhead turtle at the Dubrovnik Aquarium. Several reviews have been posted on the Internet by visitors about the dreadful experience of seeing the animal in such conditions. The turtle, a fully grown adult female, had been kept for the past 40 years in a small concrete tank surrounded by coins thrown in by visitors. MEDASSET requested clarification from a local contact, based at the Croatian Natural History Museum, who confirmed that indeed many complaints had been received from all over the globe concerning the turtle’s plight. It was suggested that the turtle would require initial rehabilitation in a larger tank, enabling it to swim and rebuild muscle strength. MEDASSET contacted the aquarium offering three possibilities to stop the turtle’s suffering: rehouse it in a larger tank, send it to a recuperation center or relocate it to another aquarium with adequate facilities. In November 2001, MEDASSET began to make arrangements for its transfer to the Stazione Zoologica “Anton Dohrn” in Naples, Italy, where Dr. Flegra Bentivegna had promised rehabilitation prior to release into the wild. In June 2002, an assistant from the Stazione went to Croatia to collect the turtle; however, the aquarium refused to release it, saying that they were due to renovate the aquarium during winter 2002 and would build a new tank. MEDASSET received a report on April 28, 2006, from a former volunteer who visited the aquarium, confirming that the turtle had been moved from its very small pool to a slightly larger one, yet it was still a smelly, dirty and shallow pond. Additionally, in 2006 a writer for the Lonely Planet Travel Guide for Croatia contacted MEDASSET about the turtle, and with her cooperation an email was sent to the head of the Dubrovnik Tourist Office threatening to tarnish the city’s reputation for animal welfare; this was also unsuccessful in changing the situation. All attempts to help this miserable turtle were met with the complete rejection of the aquarium director. A MEDASSET volunteer visited the aquarium in January 2010. The volunteer’s report and photos (available upon request) confirm the turtle’s dreadful condition, unable to properly move and submerge in the inadequate and shallow pool. Despite the numerous complaints by visitors and letters from MEDASSET and the Turtle Foundation, the turtle remains in the unsuitable pool.